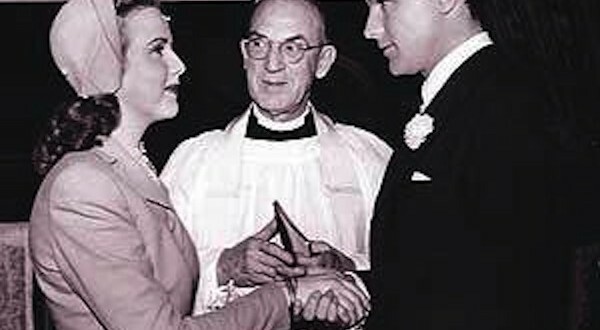 In “It Happened One Night,” The Reverend Father Neal Dodd is just being himself as he prepares to officiate at Claudette Colbert’s garden wedding – even though Colbert jilts her fiance at the altar to run away with Clark Gable. Dodd was play-acting in the 1934 film, as he did in hundreds of movies, although he really was a man of the cloth. The movie industry called on him regularly when it needed someone to play a minister or priest. He also served as a technical adviser on religious material. 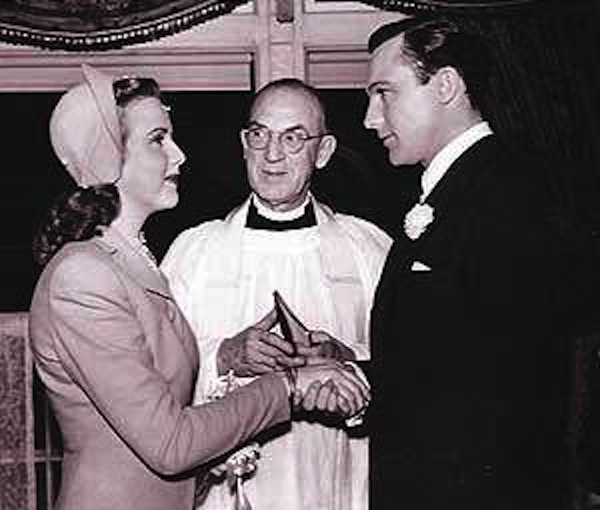 Father Dodd appeared in “Christmas Holiday” in 1944 with Deanna Durbin, left, and Gene Kelly. Neal Isaac Dodd, known as “the padre of Hollywood,” was born in Fort Madison. Little is known about his early years until he enrolled at the Art Institute of Chicago and then switched gears to take up the ministry. In 1907, he graduated from Nashotah House, an Episcopal seminary in Nashotah, Wisconsin and was ordained in the Diocese of Milwaukee. It Happened One Night – priest turned actor – performing wedding ceremony. By 1908 he was serving in San Francisco. After settling in Los Angeles in about 1917, Dodd saw the need for an Anglo-Catholic mission to serve those working in the growing movie industry. He opened St. Mary of the Angels Anglican (Episcopal) Church with a Christmas Eve Mass in 1918 in temporary quarters. 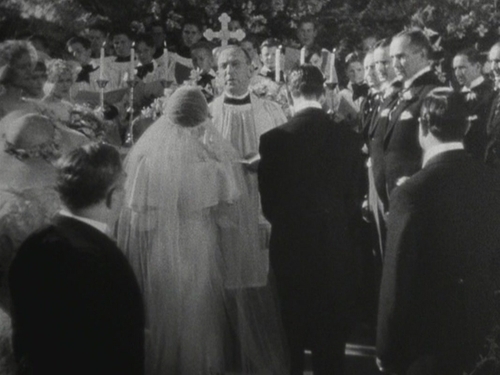 Many of Hollywood’s original stars became members of the new parish, including Mary Pickford and Douglas Fairbanks Sr. Father Dodd married the couple in a ceremony in 1920. Later, the couple offered their home, the famous Pickfair, for a lavish fund-raiser. A $50,000 anonymous donation, believed to have come from Pickford, gave Dodd more than enough money to start building his church. The Spanish-mission-style structure, completed in 1930, was declared a historic building in 1970. Today it attracts worshippers and tourists. Episcopal priest officiated in many films – from “Father of the Bride” to “Philadelphia Story” to “Stella Dallas”! We must remember the majority of US Presidents were Episcopalian. At one time, Episcopalians dominated the Senate, Congress and the Supreme Court. In 1920, the same year he began appearing on film, Dodd became the founding secretary of the Motion Picture Relief Fund. Dodd was the first clergyman to become a member of the Screen Actors Guild. One of Dodd’s first movie credits was “The Only Woman,” in 1924. He also appeared in “Four Wives,” with Iowa’s Lane sisters (1939); “Mr. Smith Goes to Washington” (1939) as the Senate chaplain; and, his last role, a priest in “Here Comes the Groom” (1951). On film, it is said, he officiated at 300 weddings, donating all his acting fees to charity. Father Dodd retired in 1961 after 43 years as rector of the church. Dodd had a daughter with his first wife, Lila, who died in 1949. His second wife, Martha, outlived him. His ashes are interred at his St. Mary’s Church in Los Angeles.